The Center for the Future of Organization is launching a groundbreaking empirical study targeting 2,000+ senior leaders from around the globe to investigate the current capabilities of leaders and organizations when it comes to leveraging social media for competitive advantage. The project is designed to generate a unique set of rich data that will be highly relevant for every organization that wants to enhance its social leadership capabilities. The OSML Global Index® will provide tangible metrics that allow companies to assess and benchmark their social practices. Companies who are interested in a deeper contextualization of the Index can use it as a basis and add questions that are targeted to their specific situation and objectives. How Can you Participate – What Do you Get? Please click here to get linked to the survey which is also optimized for mobile devices. All respondents will receive a free copy of the executive summary of the results upon request. * Please note that the survey is designed for leaders on larger organizations that face a certain degree of complexity. If you are a single practitioner or a small business, you may benefit less from this exercise. For even more benefits, spread the word in your organization! We are keen to get as many leaders as possible to engage in our quest. To get the most benefit for your company, please contact us and briefly indicate your interest. You will then receive a custom link that allows us to track all responses from your organization. Your reward: If more than 20 members of your company respond, you will receive a free copy of the detailed report (a $600 value). 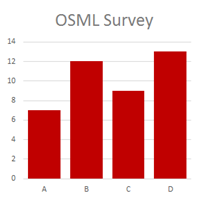 If more than 50 respond, you will receive in addition a free seat at the OSML summit (a $1,500 value). For a small fee, we also offer the option to provide a custom breakout of the results from your organization which you can compare against the global benchmark. We offer attractive corporate sponsorship packages for organizations with a strategic interest in the topic.